This Cromlech is situated on a limestone eminence, on a farm called Pant-y-Saer, in the parish of Llanfair Matharn Eithaf, and about six miles east of Llangefni. The capstone has fallen down at the south-east end, and rests on the ground, and measures nine feet each way, and is from two feet to two feet and a half thick. It has a rectangular chamber, composed of rude slabs for its sides, and they and [are] double in parts, averaging from three feet to three feet and a half high, inside, and about two feet outside. There is a very interesting account in Arch. Camb. Vol. VI 1875 by the late Rev. 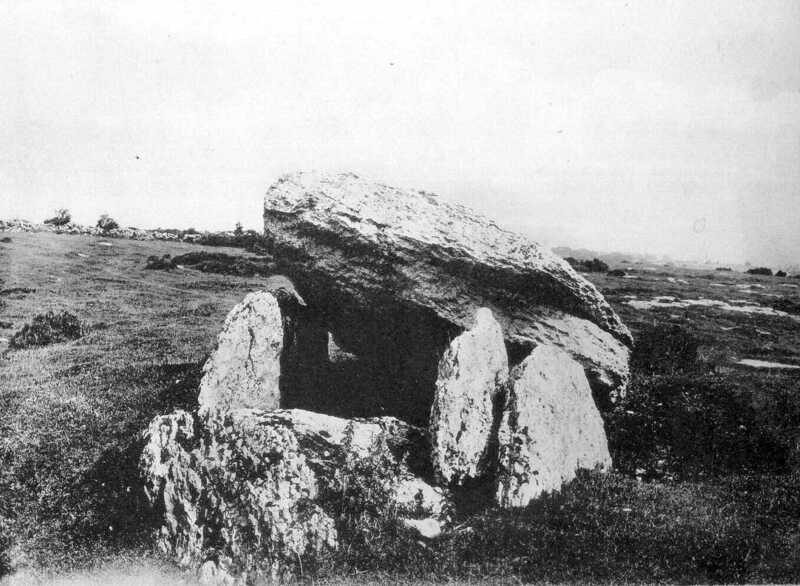 W. Wynn Williams, of the excavation of this Cromlech, where he found within the chamber a number of human bones, along with bones of animals, and shells, which undoubtedly proves that Cromlechs were originally sepulchral places. The whole structure is composed of white limestone.